Gosh, I love to pick and eat mulberries. C’mon, who doesn’t, right? 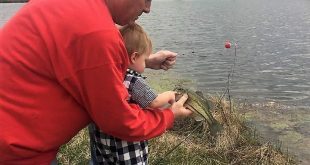 I guess it’s the Nebraska kid in me (and many of us) who like to do that! Growing up on the western edge of Gretna, NE, my buddies and I would hike the nearby woods and seek out those mulberry trees with their ripe, sweet, dark purple fruit from mid June to early July. I fondly recall the days of having purple feet, hands, lips and tongue. What a blast it was (and still is) to take to the timber and literally gorge yourself on the ripe, somewhat tart mulberries. 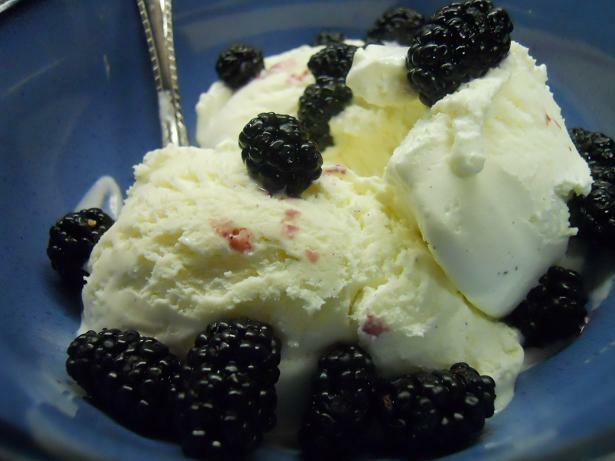 Be sure to take some home and put a few spoonfuls on your vanilla ice cream, too! Mmmm – good! 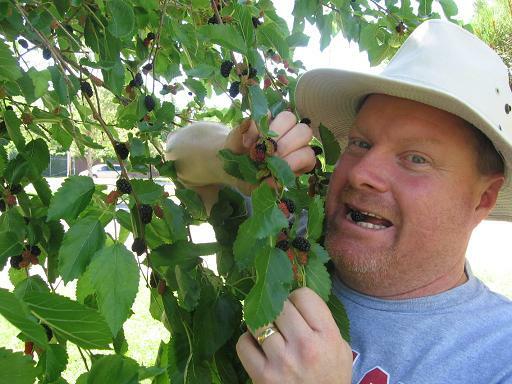 Please know that one of the things that my wife – Polly and I have done over the years with our kids, especially when they were young, is to take them on mulberry picking adventures. We enjoyed wonderful conversations while in the process of harvesting and eating the mulberries. 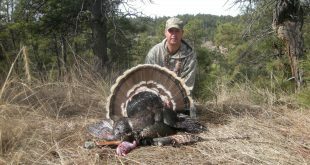 It’s a fun, hands-on summer outdoor activity to do with the family. Now, enough nostalgia. Fast-forward to the present. Guess what? 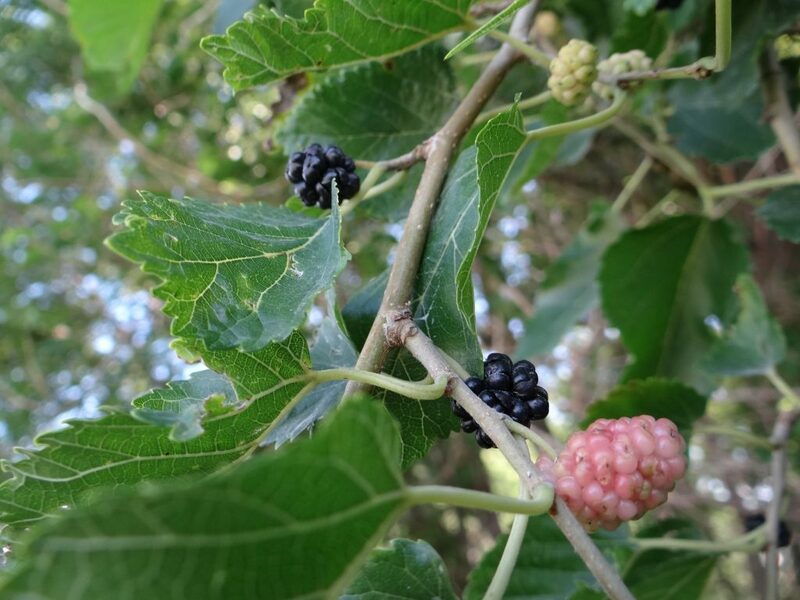 In my Omaha, NE neighborhood as well as in my southeastern Nebraska woodlands the first crop of mulberries is mainly ripe and ready for the picking! 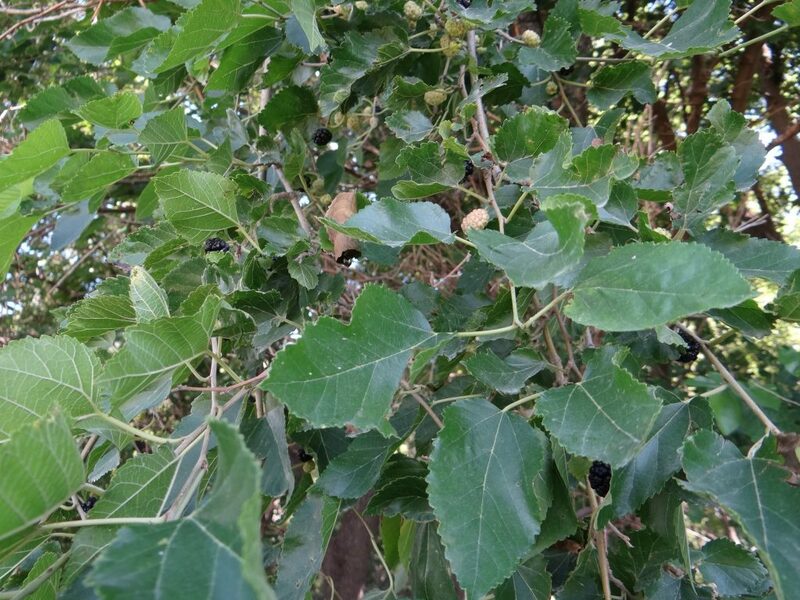 Here’s the best way to harvest mulberries in great number. – Grab an old, clean sheet from the closet. – Spread it out under the mulberry tree. – Shake the branches directly over the sheet. 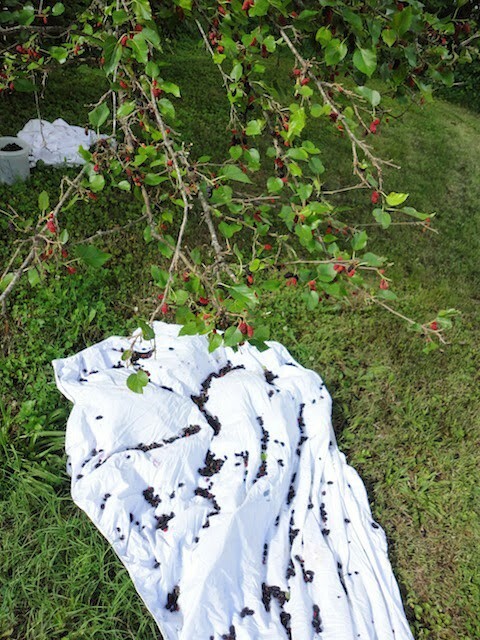 All the ripe berries just fall off and onto your sheet! If you’re careful, you can also use a ladder to reach some of the higher branches. – Gather the corners of the sheet and slide all the berries into the middle of it. – Gently slide the pile of berries to the edge of the sheet and pour the berries into a large bowl or pail. Repeat the process going around the remainder of the tree. – Sort and wash your berries as you will get some small twigs and leaves in this process. 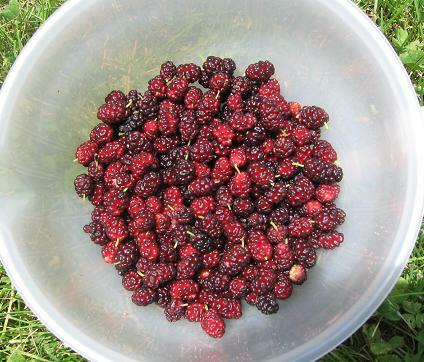 I might add the mulberries also make superb summer fishing bait and are a tasty topping for your breakfast cereal. 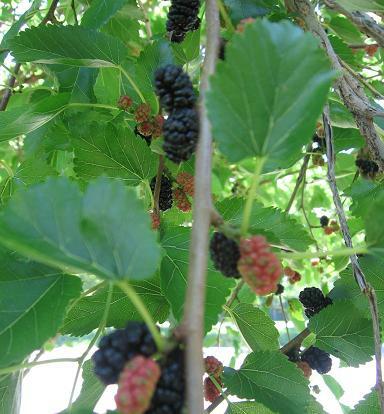 The small, flavorful fruit of mulberries have been used for centuries in pies, jams, tarts, wines, and teas. Mulberries work well in almost any recipe that calls for blueberries or blackberries. 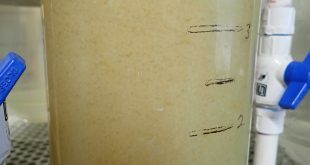 Since they’re not as sweet, they tend to work best in sweeter recipes, like jams, cakes, pies, scones, etc. 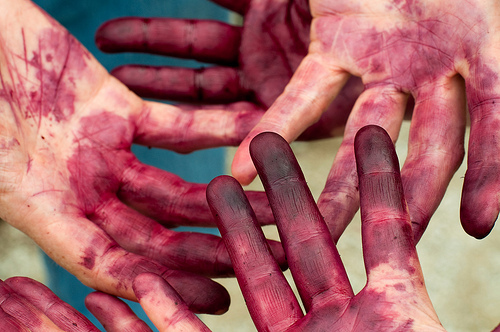 What’s interesting is that mulberries are not only delicious, but they are highly nutritious for you. 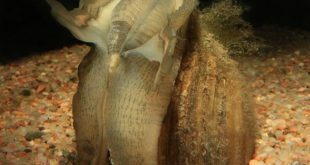 They are chocked full of vitamins and minerals, such as Vitamin A, Vitamin C, Vitamin E, iron, folate, riboflavin, calcium, magnesium, phosphorus and potassium. These berries are also a great source of fiber and protein plus considered a “superfood” due to their high antioxidant content. In addition, mulberries are an excellent food source for various wildlife species. I know for a fact that raccoons really enjoy eating them! So, what are you waiting for? Make certain the mulberry trees in your neck of the woods have not been sprayed with harmful chemicals. Then, round up the necessary items and take to mulberry lane with your family! What wonderful discussions you’ll have with your children. Just know the purple feet, hands, lips and tongue all come with a visit to mulberry lane and make for time well spent in the great outdoors of Nebraska, HA! Previous VOTE NOW: Name-the-chick finalists!